by Bev Murrill, originally posted on her personal blog. I’ve heard the Christmas messages on TV and social media through recent days. They intimate that the message of peace lies in the Christmas story. I’ve heard it too from busy shoppers, bemoaning their lot as, stressed and sweaty from their efforts, even in the middle of winter, they hurry to buy the advertised accessories to peace. We moan about commercialism, but it doesn’t stop us from joining in, big time. We scurry, along with everyone else, to buy last minute presents, and to make sure we have enough food! Enough food! I think this kind of scurrier generally has enough food. I used to think that. I used to say it too, but I don’t believe it anymore. Peace doesn’t lie in the manger. It never has. 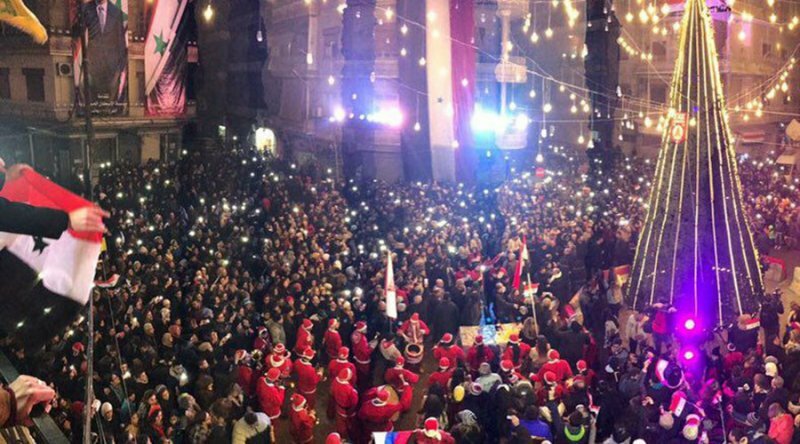 Christmas celebration in Aleppo, Syria. We have a lot of symbols for Christmas, and honestly I feel that neither jingle bells, snowflakes or Santa Claus are adequate representations of, you know, the birth of God’s Son. Angels, however, are. Angels play a huge role in the birth of Jesus. Massive, in fact. This is yet another reason I believe that people without charismatic experience or theology won’t get what the Gospel is all about. You cannot have Christmas without angels.